Although I’ve only been in Brazil for about two months, and am careful about over-generalizing based on my limited experience, it seems as if phenomenology, as a field of study, is much more active here than in the United States. In the US, phenomenology gained traction in the 1970s in the humanistic geography field, represented by researchers such as Yi-Fu Tuan, Edward Relph, and Anne Buttimer. In the early 1980s, it joined architecture through the work of Christian Norberg-Schulz. But, by the early 1990s, the field was seen as passé for many people who work and research in the built environment, replaced by more fashionable ideas. Even so, in the US, there are a number of people who have kept the phenomenology and built environment flame alive, including David Seamon, Edward Casey, Jeff Malpas, and Robert Mugerauer. But, in Brazil, there doesn’t appear to have been a similar decline, as I’ve witnessed in the books and architectural courses that are taught in universities. In particular, humanistic geography seems quite alive and well. In the US, there used to be many geography departments at universities that specialized in humanistic geography; in the English-speaking world, such departments only seem to exist in the United Kingdom. Phenomenology [focuses] on lived experience and its relevance in understanding the “foundations of meanings, things, and experiences” (Seamon, 1982, p. 119). Unlike other methodologies, phenomenology allows one to delve into the origin of perception before cognition interrupts the process and obscures fundamental feelings and subjective meanings. Because it completely relies on intuition, phenomenology is always focused on the initial, pre-cognitive, first experience (Moustakas, 1994, p. 52) and is able to reveal people’s feelings for places because “emotions almost always play a role in every phenomenological experience” (Hesselgren, 1975, p. 116). Lastly, phenomenology is well suited for questions regarding the subjective significance of historical places because such places engender feelings of “awe, wonder, beauty, and identity” (Elliott, 2002, p. 54) that traditional, objective approaches to historical significance often fail to address. There is perhaps no better example of the vibrancy of phenomenology in Brazil that the 6th National Seminar on Geography and Phenomenology. 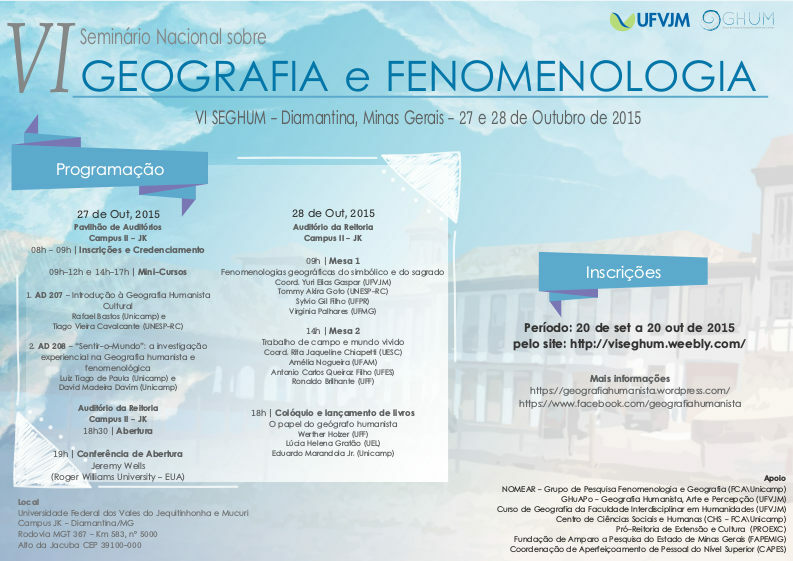 I have been invited to give the keynote presentation at this seminar which will take place October 27 and 27, 2015, in Diamantina, Minas Gerais, Brazil. My presentation will focus on the use of phenomenology in understanding the significance of historical buildings and places. I hope to find some kindred spirits there, which will help me in applying aspects of phenomenology to the research I am conducting in Brazil. Elliott, J. D. (2002). Radical preservation: Toward a new and more ancient paradigm. Forum Journal, 16(3), 50-56. Hesselgren, S. (1975). Man’s perception of man-made environment: An architectural theory. Stroudsburg, PA: Studentlitt Dowden, Hutchinson & Ross. Moustakas, C. E. (1994). Phenomenological research methods. Thousand Oaks, CA: Sage Publications. Seamon, D. (1982). The phenomenological contribution to environmental psychology. Journal of Environmental Psychology, 2, 119-140. Wells, J. C., & Baldwin, E. D. (2012). Historic preservation, significance, and age value: A comparative phenomenology of historic Charleston and the nearby new-urbanist community of I’On. Journal of Environmental Psychology, 32(4), 384-400.